The core tenet of St Anselm's is the teaching of Jesus to love God with all your heart, soul, mind and strength and your neighbour as yourself. The life of St Anselm's church community takes its lead from there. At the Sep 2014 AGM, the St Anselm's congregation expressed its concern regarding the Presbyterian General Assembly ruling that those involved in a sexual relationship outside marriage cannot become ministers or elders. Read the AGM motion along with our previous response from Nov 2006. In 1992 we celebrated the 150th anniversary of the Congregational Union Church in NZ. 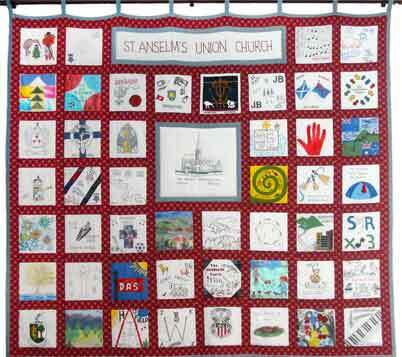 The quilt which hangs in the church commemorates this milestone. It features blocks made by each family in the parish at the time, showing something special about their life in the church and community.